Something that was a problem for me also. I took off the spare wheel mount complete and turned it up side down - this lifted enough for me to get my trailer hitch on. Unfortunately the 'legs of the bracket are not the same length', so you need a spacer or some 6mm thick washers on one side so it sits parallel to the back door again. The other snag is the pin that holds the wheel up whilst you put on the wheel nuts, is pointing down - not really a big problem though. I did this about 5 or 6 years ago and no problems / rattles or anything coming loose. To be able to open the back door fully when my Namib is hitched I bought an aftermarket jockey wheel clamp and mounted it on the A frame - so my jockey wheel sits horizontally. I don't have to keep it in the car anymore. Depends how much you want to lift it, but this is a quick simple solution. Hope it was of some use. Let's use the old pic of my red Pajero in this thread as a demo. 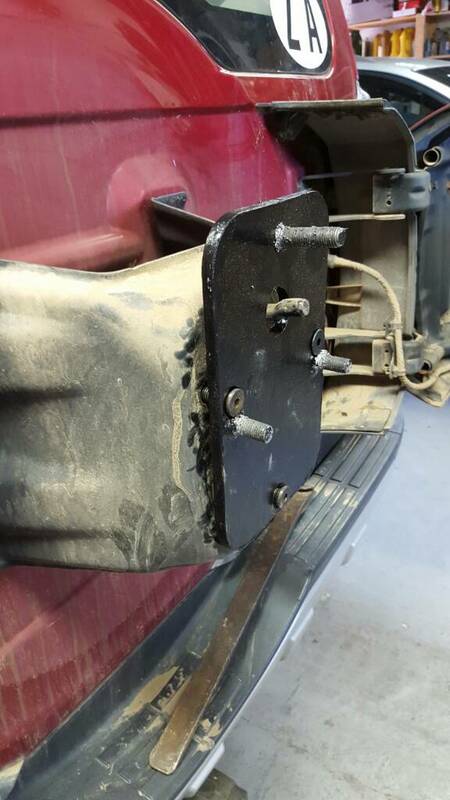 Did you take that complete dust covered hunk of tin that bolts onto the boot door and turned it upside down? Brilliant! This gave you how much of a lift? Somewhere on my pc I have a picture of the lift plate. I'll fish it out and have one laser cut and test fit on my shortie. Like the idea of using wheel nuts to secure the wheel. If I remember the lift is about 50mm. Bear with me a few days, I'm a little overloaded at work. The bracket is not symmetrical so it needs spacing on one side to bring it back parallel to the back door. Doing this also moves it away from the door (because of the longer side) , but a standard 265 tyre stlll fits. The hook to help you position the spare is now pointing down. A quick fix that probably cost me about R5, I did it just to try, but ended up leaving it - this was about 5 yrs ago!